There's no better way to launch summer vacation than by planning a family road trip. But these aren't your typical destinations. Roadside attractions offer an unusual journey, and for little expense. While some may be gaudy, that's just part of their charm. Thousands of these outrageous monuments, art installations, and landmarks are scattered across the country, but we only picked ten. Check them out, and share your favorites with us! Come to a real-world Jurassic Park. Ms. Dinny, a 150-ton dinosaur, is the largest concrete dino in the world. You can even climb to the top of a life-size Tyrannosaurus rex. The concrete prehistoric creatures are just a short distance west of Palm Springs, California and can be seen from Interstate 10. Don't tell Pedro he's in South Carolina, not Mexico. Lured by hundreds of billboards down Interstate 95, South of the Border has become a small town with a motel, restaurant, reptile zoo, and a whole lot more. Travelers bound for Florida can't miss it. It's advertised as the largest truck stop in the world, but it draws more than just professional drivers. In the summer, up to 5,000 visitors will stop here for fuel, food, and shopping. 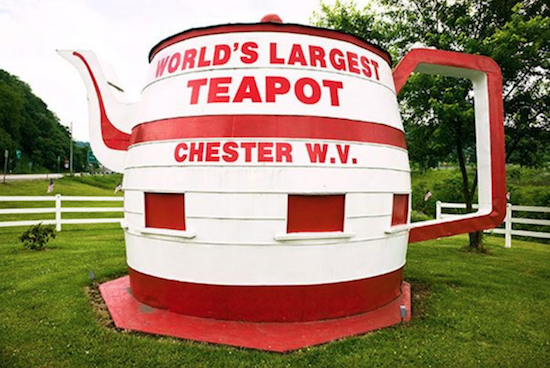 The teapot along Highway 30 is located on the site of a former popular amusement park. It measures 14 feet in height and 14 feet in diameter. Roadside attractions are even found in major cities. If you want some delicious ice cream served from a 40-foot milk bottle, here's your stop. The 80-year-old icon is located next to the Boston Children's Museum. If foam isn't your thing, how does a Stonehenge replica made of 38 vintage American cars sound? Since 1987, this artist installation has attracted drivers from all over the Midwest. It's not just the name of a Bruce Springsteen song. Cadillac Ranch, a row of graffiti-covered half-buried Cadillacs, was built in 1947 by a group of local artists. The iconic installation of vehicles is even buried at angles corresponding to the Great Pyramid of Gaza. The Enchanted Highway is the world's largest collection of scrap metal sculptures. The project began in 1989 and is still growing today thanks to artist Gary Greff. Once you reach the end of the Enchanted Highway in Regent, you can spend the night at a new motel called The Enchanted Castle. Now an Oklahoma National Historic Landmark, The Blue Whale is one of the most recognizable landmarks along historic Route 66. While the water park and reptile zoo from the 1970s no longer exist, the landmark was recently refurbished, and the picnic area was reopened, making this the perfect resting spot. Experience a taste of the Old West at this former gold-mining town on the historic Apache Trail. Learn how to pan for gold, watch a reenacted wild-west gunfight, and tour historic buildings, the Mammoth Gold Mine, and the Goldfield Museum in this reconstructed 1890s ghost town.